This wedding invitation features a lovely border made of a mixture of fresh garden blooms of peonies, ferns, and wild flowers against a gorgeous watercolor painted background. The back of the invite includes a pattern of sweet stripes in coordinating colors against a lush watercolor background. Like this wedding invitation? You can personalize it with your own wording and details at elli. 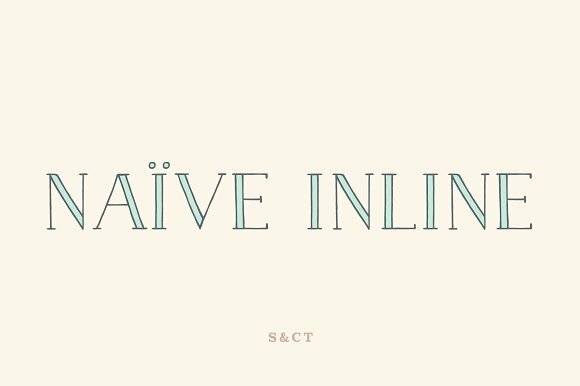 Naive Inline is a serif handwritten font designed by Fanny Coulez and Julien Saurin and released through S&C Type. This retro-Parisian typeface is available in three weights, light, Medium and Bold. The typeface also comes in three sets of interiors, which allow you to improve your designs and bring a nostalgic and unusual feeling by combining the basic fonts and interiors. You can buy and download Naive Inline at CreativeMarket.